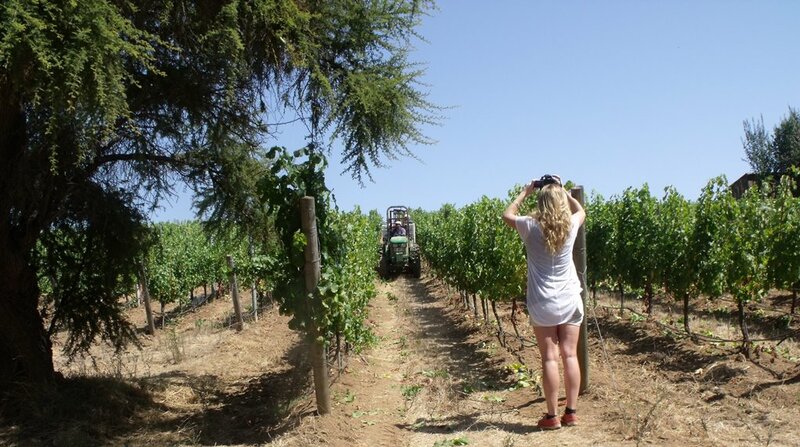 Recently I had the good fortune to spend 48 hours on the road with wine journalist Amanda Barnes during the Chilean leg of her journey Around the World in 80 Harvests. Our schedule took in three wineries in the San Antonio and Casablanca regions right at the time they were harvesting grapes. 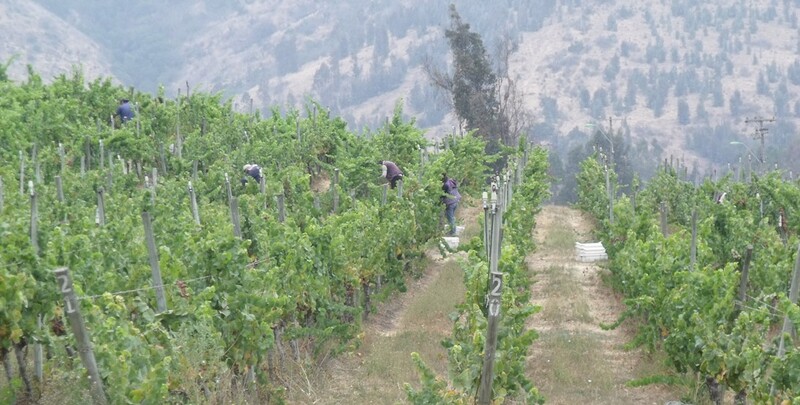 Casa Marín winery is situated so close to the Pacific Ocean you can almost taste the sea air. This part of the San Antonio Valley is famous for its cool, cloudy mornings and the morning we arrived was no different. That, after all, is part of the secret behind Casa Marín’s award-winning white wines. No chance of grapes rushing headlong into maturity here as can happen in warmer, sunnier places. 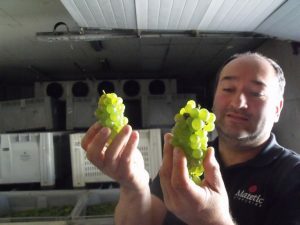 Winemaker Felipe Marín talked us through this exceptional terroir as we walked across the cracked clay earth where a team of workers was rhythmically snipping bunches of Gewurztraminer grapes off the neat rows of vines and dropping them gently into plastic boxes. It was very quiet: just the gentle snipping of the grapes and some distant birdsong. Felipe sighed when we asked about the birds. It seems nobody has as yet found an effective way of keeping a determined flock of birds off a vineyard full of juicy grapes and he said that they always lose a percentage of the crop to the thrushes. 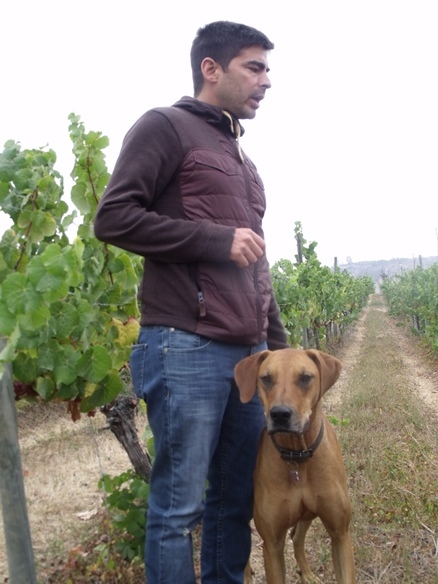 I noted that the vines had another, less common predator too: one of the winery dogs kept sloping off to steal grapes from the vines whenever Felipe wasn’t looking. 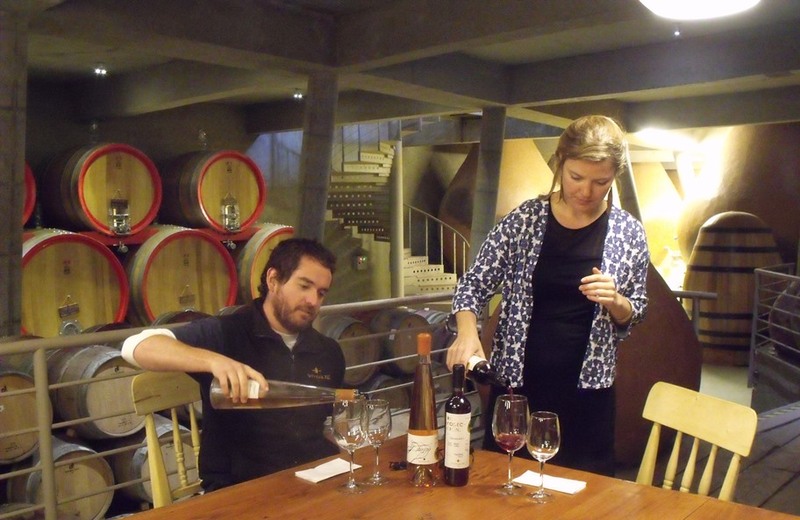 We spent a couple of hours with Felipe, while Amanda asked detailed questions about the region, climate, the vineyard and its soils, viticultural practices and the resulting wines, a detailed interview she repeated with the winemakers at each of the three wineries. Amanda says that she’s developing a comprehensive database of information about soils, climate, grape varieties, pests and diseases, pruning, training and irrigation systems and so on for each of the 80 regions around the world that she plans to visit. The sun came out as we reached our next stop: the immaculate biodynamic estate of Matetic, so large it falls into both the San Antonio and Casablanca regions. Here we got the full red carpet treatment – clearly they were aware that Amanda is a rising star in wine journalism, and they were certainly enthusiastic about her 80 harvests project. We were met by Constanza Moya, the winery’s Tourism Commercial Director, who took us to see the team harvesting Sauvignon Blanc grapes nearby. Then we talked about wine tourism – something Matetic takes very seriously – over a delicious salad on the terrace. We had twenty minutes to check into our perfectly appointed rooms in the winery’s luxury hotel, the Casona, before heading out for the 15-minute drive to the winery’s cellar. 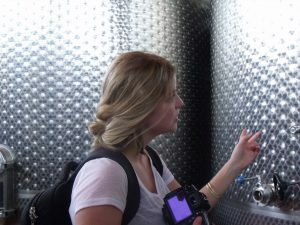 Amanda did an extra speedy interview with the busy head winemaker, Julio Bastías, and then he took us on a whistle-stop tour of the winery. Julio showed us some grapes that had just arrived in perfect condition. Then we were able to try some of this year’s wines straight from the tank prior to jumping in his truck for the drive back to the hotel. A few minutes into the journey, he stopped the car and ran across the road to hack at a section of exposed rock with a small hammer. He wanted to show us some of the rocks that form part of the soils in this area: feldspar, tuff and granite. We had a scant hour and a half in which to type up our notes from the day and freshen up, then it was a private dinner in the company of Matetic’s chef and head waiter, who served up a series of exquisite dishes, each accompanied by one of Matetic’s wines. Amanda somehow summoned the energy to record a video interview with our chef in between the main course and the dessert. We were both up early next morning – I needed to kick-start my day with a few litres of strong, black coffee – and Amanda, of course, wanted to snap some photos of the vineyards shrouded in the characteristic morning mist for which this cool climate region is famous. We hit the road again around 10 am and the sun had already burned through the fog by the time we reached Bodegas Re, the small, innovative Casablanca Valley winery owned by Pablo Morandé and his family. We were met by Pablo Morandé junior, who fortunately brought some more coffee. Amanda may have been still fresh as a daisy, but I was feeling the effects of this fast-paced trip, the heavy meal and late night. After the formal interview, we spent a while tasting two of the winery’s most interesting wines – their brand new, highly aromatic orange wine Enredo and the very easy-drinking limited edition Recolección – and chatting to Pablo about Chile’s wine industry and the future of the Casablanca Valley. Then it was time for me to head home, while Amanda drove southward to experience the harvest at Cono Sur. It had been a pleasant break from the routine and a privileged opportunity to see the grapes being harvested and talk with the winemakers. I look forward to reading about Amanda’s further travels on her website. 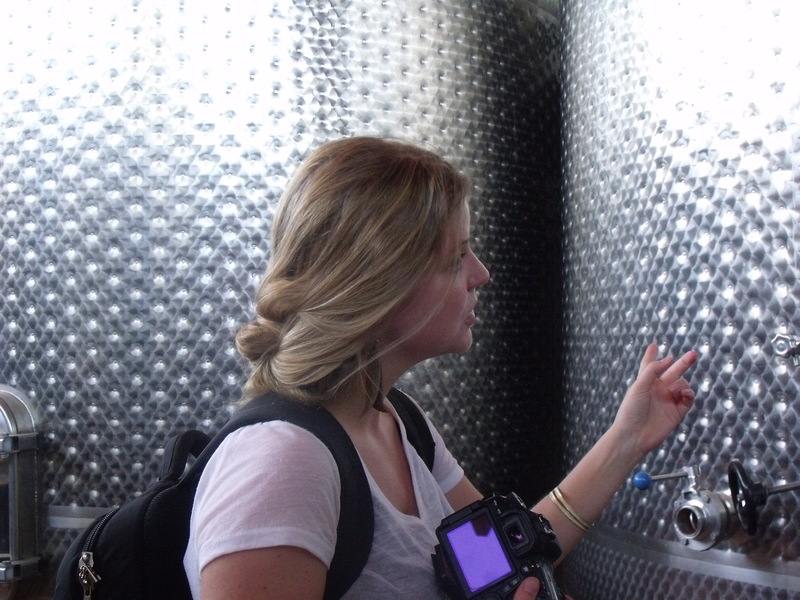 Amanda Barnes is a wine journalist who has been based in South America for the last seven years, writing for the likes of Decanter, The Drinks Business, The Telegraph, The Guardian, Fodor’s Travel Guides, and Wines of Chile. She has been on the road with 80 harvests since February, visiting wineries across South America and recording their harvests in photos, on video and in words. To find out more about the places she has been visiting, check out her website. It was a pleasure to have you on the road with us Helen! Thank you for the great write up and all your help in Casablanca, and beyond! I look forward to reading more of your interesting blogs. Thanks Amanda! Look forward to hearing about your forthcoming adventures in North America!